Difference between revisions of "A Haitian Revolution Primer"
The Haitian Revolution can seem at times like a tangled thicket of stories, motives, characters, and events. To get the lay of the land, we suggest you start here, with these links to the essential characters and events of the period. Note that you might find the [[Timeline_of_Events_in_Haitian_Revolutionary_History|Timeline]] a useful resource as you read. Also check out the [[List of Books]] for in-depth resources. 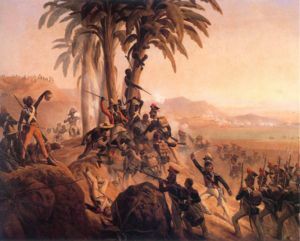 [[image:saint_domingue_battle.jpg|right|thumb|300px|Battle scene of the Haitian revolutionary war as imagined by the painter Suchodolski.]] The Haitian Revolution can seem at times like a tangled thicket of stories, motives, characters, and events. To get the lay of the land, we suggest you start here, with these links to the essential characters and events of the period. Note that you might find the [[Timeline_of_Events_in_Haitian_Revolutionary_History|Timeline]] a useful resource as you read. Also check out the [[List of Books]] for in-depth resources. : Start with [[An Overview of the Haitian Revolution]] to get the satellite picture of the period. : Start with '''[[An Overview of the Haitian Revolution]]''' to get the satellite picture of the period. : [[Toussaint Louverture]], this former slave became the leading general and statesman of the revolution. : '''[[Toussaint Louverture]]''', this former [[slave]] became the leading general and statesman of the revolution. : [[Léger Félicité Sonthonax]], a French Commissioner who freed 15,000 slaves in 1793.
: '''[[Léger Félicité Sonthonax]]''', a French Commissioner who freed 15,000 slaves in []. : [[Comte de Laveaux]], French Governor-General of Saint-Domingue, a close friend of Toussaint. : '''[[Comte de Laveaux]]''', French Governor-General of [[Saint-Domingue]], a close friend of Toussaint. : [[Jean Jacques Dessalines]], a general in the rebel army, he would become the first leader of Haiti. : '''[[Jean Jacques Dessalines]]''', a general in the rebel army, he would become the first leader of [[Haiti]]. : [[Henry Christophe]], rebel general, he would later become Emperor of Haiti. : '''[[Henry Christophe]]''', rebel general, he would later become Emperor of Haiti. : [[André Rigaud]], leader of the Mulattos during the rebellion. : '''[[André Rigaud]]''', leader of the [[mulattos]] during the rebellion. : [[Charles Victor Emmanuel Leclerc]], Napoleon's brother-in-law, leader of the expedition to retake Saint-Domingue and re-institute slavery. : '''[[Charles Victor Emmanuel Leclerc]]''', [[Napoléon Bonaparte]]'s brother-in-law, leader of the expedition to retake Saint-Domingue and re-institute slavery. : The legacy of the revolution. ** [[:Category:Glossary]] - A glossary of words used on The Louverture Project. ** [[:Category:Who's Who]] - A complete list of people referenced at The Louverture Project. ** [[:Category: Dates of the Haitian Revolution]] - Important dates of the Haitian Revolution.